Será que os blogs sobre livros têm sempre de ser sisudos e altamente intelectuais? Claro que não... Para mim, a música faz parte da escrita, com também da própria vida. E porque não rock, drum and bass e trip hop? It's your day believe it, it's your date with destiny"
Director Breck Eisner says that his remake of the 1954 classic Creature from the Black Lagoon planned will be an “aggressive sci-fi horror film in the vein of Alien” . . . This is ironic considering that ultimately this popular ‘Fifties flick proved to be an influence on flicks such as Spielberg’s Jaws, Predator and Alien itself. However watching the original Black & White movie one wonders whether the world actually needs yet another Alien clone, or even a Creature of the Black Lagoon remake for that matter. To recap: Creature of the Black Lagoon will start filming as soon as director Eisner wraps up yet another remake, this time of George Romero’s 1970s disease-turning- people-crazy thriller, The Crazies. Budget is said to be $90 million and Bill Paxton is “rumoured” to star in it. (Don’t bet on it though.) Filming will be on location in the Amazon. “There's this place called the Forest of Mirrors, because there are so many lagoons on a thousand mile green carpet river, and we found the lagoon we're going to shoot in.” The creature itself has been redesigned, a process that took the film-makers a whole six months. In the original film a scientist discovers a fossilized hand in the Amazon that seems to belong to some unknown species of creature. The hand is webbed and appears to be almost human. The scientist brings in some scientists to look for the rest of the remains. The new team doesn’t find anything, but it seems that something even “better” is out there: a live specimen of a hitherto unknown humanoid amphibian creature. Only problem is that this creature doesn’t take too kindly to crowds of people camping in what must literally be his backyard and it starts killing them off one-by-one. The creature (known as “the gill-man”) also takes an unhealthy liking to the only female member of the scientific expedition just as any warm-blooded, er, amphibian would . . .
Hollywood has toyed with the idea of a Creature remake as long ago as 1982. Back then American Werewolf in London director John Landis wanted Jack Arnold, the original film’s director, to direct a remake. In 1995 Universal gave Peter Jackson a choice between remaking King Kong and Creature (Jackson chose Kong because watching the original 1930s Kong as a kid inspired him go into movies in the first place). In 2002 Guillermo Del Toro was attached to direct, but finally quit because he had too many other projects on his slate. A Victorian expedition group searching for fossils along the Amazon locate an area that has been kept on a tangential track of evolution alongside mankind, untouched by modern man, and filled with strange and fantastic creatures. This haven is guarded, however, by a sleek and clever gill-man: the Creature from the Black Lagoon. Things have undergone a change since then according to producer Ross as the setting has been updated to modern times. Now the gill-man won’t be a lost and forgotten species being rediscovered, but will be the result of a pharmaceutical corporation polluting the Amazon. “It’s about the rainforest being exploited for profit,” Ross elaborates. Obviously it isn’t only the rainforests being exploited for profit here . . . 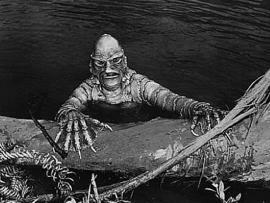 It is understandable why Hollywood is attracted to Creature from the Black Lagoon. The movie has permeated popular consciousness thanks to its iconic monster design, a design which has largely lived on thanks to a popular pinball machine and has been parodied endlessly in anything from Mad magazine to The Simpsons. It’d be foolish of Hollywood not to exploit this familiarity (or “pre-branding” as marketing folks will call it). Unfortunately if the interviews with Ross and Eisner are anything to go by, the monster design won’t be only thing over-familiar to audiences. The plot would be all too familiar to cinemagoers as well . . . The past decade or so has seen a spate of boat-on-a-river-threatened-by-a-monster movies, anything from Anaconda and Rogue to Primeval. Creature from the Black Lagoon seems to heading in the same direction. After all, how would you feel if you’re just hanging out peaceably at your favorite lagoon one day when some noisy strangers start dumping fish poison and cigarette butts in the water where you live? You’d be irked too. Also, you’d also be wanting to get it on with the luscious Julie Adams, a prime piece of long-legged 1950s cheesecake if we have ever seen one, even if you do have gills and scales . . . The point is how are we supposed to find an “aggressive” Thing-like creature even vaguely sympathetic? Eisner seems to be missing the point here to be honest. Did he forget that the creature actually falls in love with the heroine? Or maybe Eisner were thinking along the lines of Sigourney Weaver getting it on with all kinds of slimy beasties in Alien Resurrection here? Sure, Creature of the Black Lagoon is ripe for updating. It is quite out of date today with its bizarro religious opening scene replete with voice-over narration so typical of Fifties science fiction movies; the unintentionally hilarious gait of the monster itself; and the somewhat languid pace. It isn’t scary at all, but it sort of predates all the current tourist horror flicks in which locals take “revenge” on good-looking tourists in movies such as Turistas, Hostel and The Ruins. When one thinks about it the gill-man was the original irate local who had it in for obnoxious American tourists . . .
Cientistas, escritores, matemáticos e inventores que deixaram um importante contributo em áreas como a química, a lógica, a física, a medicina. Resgatando muitas dessas figuras ao esquecimento, o historiador Joaquim Fernandes concretizou uma inédita pesquisa sobre os homens e mulheres que deixaram uma inquestionável marca na História. Sabia que na corte de Catarina, a Grande, existia um médico português? Próximo da czarina, Ribeiro Sanches serviu a soberana russa sendo considerado um dos grandes percursores da reforma pombalina. Em Londres ardeu em praça pública Cavaleiro de Oliveira, escritor e diplomata que não se quis calar editando polémicos escritos. Encarcerado na Junqueira morreu aquele a que os alemães chamaram de “Newton português” – Bento de Moura, físico e inventor. Herói da independência do Brasil, Andrade da Silva descobriu o terceiro elemento químico, o lítio. Talentosos, lutadores e por vezes ignorados em vida, contam-se os atribulados percursos de vida de homens e mulheres que, dentro ou fora do país, deixaram um inquestionável contributo. “Invocamos neste inventário – que não poderia ser definitivo, antes ilustrativo – o tríptico em que assenta o afrontamento e a incompreensão da sociedade portuguesa perante muitos criadores e pensadores da diversidade científica e cultural, das heterodoxias ideológicas e religiosas: errância, ignorância, intolerância, definem, a nosso ver, os nódulos conflituais que resulta(ra)m do cruzamento entre as minorias mais inconformistas e o corpo maioritário da nação. Historiador, professor na Universidade Fernando Pessoa, co-fundador do Centro Transdisciplinar de Estudos da Consciência. Especialista no estudo do imaginário português, começou por editar «Ovnis em Portugal (1978), seguindo-se «Intervenção Extraterrestre em Fátima» (1982), «As aparições de Fátima e o Fenómeno Ovni» (1995), «Fátima, nos Bastidores do Segredo» (2001), «Heterodoxias para o século XXI: novas fronteiras da Ciência» (2001), «Silenciados e Silenciosos» (2005), «O Cavaleiro da Ilha do Corvo» (2007). Personagem eterna no imaginário cinematográfico, mesmo para alguns que não apreciam o género. Apesar de ter algumas dúvidas relativas a filmes que são aproveitados até ao limite, podendo perder a sua essência ( veja-se Alien 3 e 4 e o subproduto Alien vs Predator... ), não posso deixar de me sentir feliz e curioso depois de saber do interesse de Sigourney em mais um Alien. Que venha ela ( mesmo já nos 60 ) e Ridley Scott! 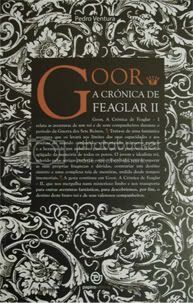 Que venha uma das melhores sagas de sempre! "A actriz Sigourney Weaver não descarta a possibilidade de voltar a interpretar a tenente Ellen Ripley num novo filme da saga Alien. "Eu definitivamente faria outro Alien se tivesse um realizador como Ridley Scott e uma boa ideia", contou à revista OK. Ela ainda concluiu dizendo que "Ridley está entusiasmado com a ideia". A actriz acredita que, se Harrison Ford e Sylvester Stallone podem voltar a interpretar os seus personagens mais famosos (Indiana Jones e Rambo, respectivamente), ela também pode. " A escritora Carla Ribeiro tem para vos apresentar um novo livro electrónico. Imagine-se uma alma dispersa por entre todas as sombras do obscuro, afastada de todos os sonhos e de todo o alento que ilumina a vida. Que pensamentos vagueariam por essa mente desolada? Que emoções cantariam ao seu coração? "Fragmentos de Sombra" é um conjunto de reflexões e desabafos, plantados entre o limite da ficção e a realidade de momentos que, com mais ou menos força, todos encontramos ao longo da estrada que é a vida. Por vezes uma gótica melancolia, seguida então de uma vaga ilusão de esperança, este é o caminho para o abismo, a estrada interminável de todos aqueles que caem em cada crepúsculo... para renascer na luz de uma nova aurora. Se não me faltam na memória referências televisivas de ficção científica e fantástico, também há que referir esta série, representativa de um género que contactei mais através dos livros, mas que deixou claras marcas no meu modo de ser e escrever. Seja qual for a versão, Guilherme de Bürglen ( real ou não ), é daquelas personagens em que gostamos de acreditar. É um rebelde que luta contra um tirano, sem nunca deixar de ser um ser humano como todos nós, é uma esperança em tempos "negros". Pode ser um arquétipo, mas é algo que alimenta a imaginação. E que hajam heróis, lendas e quem acredite nelas! Já se encontra disponível para venda na internet o livro Páginas Lentas, colectânea de autores de Viseu, do GICAV, que inclui o conto "Darwar de Celénia" de Pedro Ventura.